The program is designed to provide students the opportunity to develop their skills in evidence-based practice, quality use of medicine, practice-based research and the provision of high level Addiction services. The program is aligned with the Level 9 of the Qualifications Framework for the UAE approved by The Board of the National Qualifications Authority (NQA) known as the QFEmirates. The program will support further development of self-reliance and an independent approach to learning in support of professional development. Produce Addiction Clinical Practitioners capable of providing specialized health care services in hospital and other clinical environments. To facilitate graduate to become licensed practitioners in Addiction Psychiatry, Addiction Rehab Specialists and Addiction Specialist Nursing, based on the professional background, program concentration and according their licensing authority regulations. Produce confident and knowledgeable Addiction Clinical Practitioners as well as law enforcement officers working in the field of addiction. To enhance the addiction clinical practitioners’ role as a member of the healthcare team by improving their communication, managerial, clinical and research skills. To provide a pathway towards academia as a career in Addiction. To provide learning opportunities to enable to think critically and to further develop as an autonomous and lifelong learner. An applicant with an undergraduate qualification from an English-medium institution who can provide evidence of acquiring a minimum TOEFL score of 500 on the Paper-Based test, or its equivalent on another standardized test approved by the Commission, at the time of admission to her undergraduate program. Note: To be eligible for this exemption you must have completed your studies no more than two years prior to the start of the postgraduate degree program for which you are applying. Male and female, both will be admitted. It will be a co-educational course. Must achieve an overall grade point average of Grade C or 3.00 on a 4.0 scale, or its established equivalent, in the first nine credit hours of credit-bearing courses studied for the Master’s program. Must achieve an overall grade point average of 3.00 on a 4.0 scale, or its established equivalent, in the first nine credit hours of credit-bearing courses studied for the Master’s program. The following documents should be submitted along with the application form. The original certificates is to be brought in person by the applicant at the time of interview. Six passport size color photographs. Copy of the passport and resident visa (for expatriate students only). Copy of UAE National ID. Students must meet the English language proficiency requirements such as minimum TOEFL score of (79 IBT) or 6.0 in IELTS. DMC requires applicants to submit their transcripts for evaluation of transferable subjects /teaching hours from previous college experiences. The student must provide a letter of application to the Dean of the College specifying reason(s) for requesting transfer and desired date of transfer. All applicants must provide conduct certificates from the College where they are currently enrolled. No student who has been dismissed from any College will be eligible for transfer to DMC. The student transferring from another accredited college must be in a good academic standing (CGPA of 3 on a scale of 4.0, or its equivalent) in BSc. The student must have earned a grade of “B” or better in the course. No more than six credit hours of graduate work may be transferred from another institution. The courses must be graduate level and have been taken for graduate credit at the accredited institution. The final decision for approval of transfer will be made by the Dean after review of the transfer request. Student intake will be a maximum of 20 students per year. There are 6 lecture halls all of which are duly equipped with state of the art audio-visual aids and wireless network access. DMC provides 9 basic science laboratories for the students. The post graduate program uses the following labs. Biochemistry Laboratory: This facility is equipped for training on laboratory diagnostics including electrophoresis and PCR. Histopathology Laboratory: This facility is equipped with par-focal, illuminated, binocular microscopes for each student, binocular teaching microscopes and explanatory slides on various body systems for the study of diseases. Microtome has also been made available for the preparation of slides. College Museum: This facility is equipped with gross specimens of different organs. Anatomy laboratory: This facility is equipped with cadavers preserved in formalin and plastinated organs, plastinated sections, plastic models, human bones, skeletons, X-rays, CT scans & MRI’s and interactive audiovisual aids. Physiology Laboratory: This facility is equipped with state of the art teaching facilities for clinical and experimental physiology. Pharmacology Laboratory: This facility is equipped with education software such as PCCAL and equipment to facilitate testing on experimental animals. Molecular Biology Laboratory: This facility is well equipped to conduct tests like PCR, ELISA, and Western Blot. DMC library is housed in a recently renovated library which contains around 4000 printed books, the catalogue of which is available on the college website (www.dmcg.edu) through the link <dpc.follettdestiny.com> which can be accessed on the smartphones also. The databases are a very good resource of electronic books available to students 24/7, even outside the college. College library supports the program by maintaining recent learning resources required by both the specializations. VLE (Virtual learning environment) is available through desire2Learn platform. The teaching learning and examinations are conducting using this platform. This center is equipped with 80 computers and projection facilities, where computerized examinations are conducted. This center is also the venue for conducting elective project presentations, interactive learning and clinical skills training. The whole college is covered by WIFI and internet connectivity. The college provides the students with the LMS (Learning management system) to facilitate learning. The LMS is a software application for the administration, documentation, tracking, reporting and delivery of electronic educational (also called e-learning) courses materials or other training programs. You can see on the calendar all important events in your college and deadlines of different activities. Your instructor may build a survey to take your opinion and record it on the system. You can keep some of your files, notes in a special locker which can be seen by you only to use it later on. You can also send email to instructor and paste your photo in your profile and much more. When you need to know how to maximize the use of LMS you can go to the section of “@D2l friend of students” to find material, video, documents and tutorials on how to use our LMS. A plush resting area located around the round hall allows students to rest and relax during their intervals. The College provides a study room, mosque, a mini-mart and a cafeteria. The clinical facilities at ERADA provide a valuable opportunity for the students to train in real-life inpatient and outpatient setting. The powerful Wi-Fi system at the ERADA center will help students and faculty members for seamless communication and transfer of learning materials. A classroom with capacity for 15 students and a reading room, ward review rooms will be available for students at ERADA center. These locations will be booked for students on the days of their posting by the coordinator. The post graduate program is delivered full time through two academic years at Dubai Medical College. This is an MSc ACP program which is 2 years is articulated to provide opportunity for students to obtain a PG Diploma ACP by completing the first year. – Each academic year is evenly divided between two Semesters running from February to June and September to January. – Each semester is composed of fifteen weeks of study including examinations. The two semesters of the first academic year are devoted to formal taught modules scheduled to be given over weekend (Fridays & Saturdays). The second academic year consists of a major research project and clinical clerkships. Clinical clerkships are provided at ERADA Center for Treatment and Rehab. 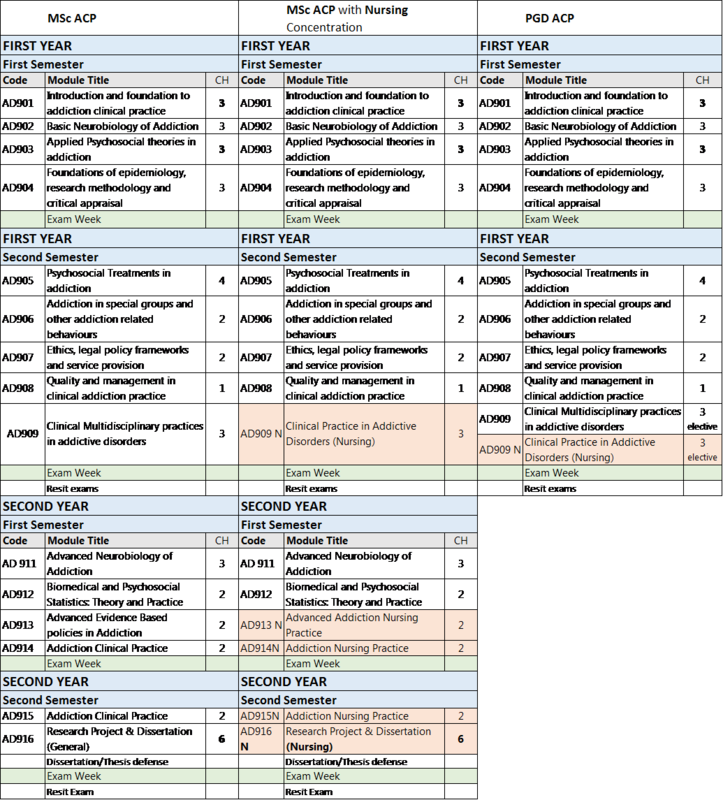 The mandatory credit hours required for MSc is 41 which have to be covered in 9 core modules and 6 specialized modules. Students who opt for nursing concentration are required to complete specialized modules for nursing. – Students who wish to enroll for a PG Diploma will have to complete all the 24 credits provided in the first year. Each academic year is evenly divided between two semesters running from February to June and September to January. The two semesters of the first academic year are devoted to formal taught modules scheduled to be given over weekend (Fridays & Saturdays). The mandatory credit hours required for PG Diploma is 24 credits which have to be covered in the two semesters. 1 Credit hour is defined as 15 hours of teaching /learning sessions in classroom. These are usually conducted over a period of 15 weeks. It is also presumed that for every hour of class, a student should spend 2 hours of independent study/assignment time outside class time. Therefore, one academic credit equals to a 45 hour commitment to learning over a semester. The classrooms at DMC are equipped with updated technologies. The laboratories at DMC are well equipped with latest equipment and instruments for performing Lab work and conducting research. Didactic method is only used in introductory courses and beginning lectures of any course. The usual traditional lecture where it is teacher center and depend mainly on the narrative mode of delivery with an interrupted questions to assure students comprehension and understanding. In these methods, the role of instructor is that of facilitating learning rather than transferring knowledge. Students -centered teaching methods have more positive perceptions on teaching and learning, knowledge and skills, outcomes of their course materials and satisfaction compared to the students belonging to didactic method of education. In student-centered education, learning is perceived as a qualitative change of student’s conception of phenomena and ideas and, consequently, knowledge is actively processed by the student. It improves the students’ usage of learning resources and problem-solving abilities. These methods are scenario based interactive lectures, Problem-based learning, student written assignments, brainstorming sessions, small group discussions, and student seminars. A case scenario is distributed to all students at the beginning of the lecture or presented in ppt. The student will be asked to read the case & ask about unclear terms or expression in the case. The case is analyzed in the classroom through the discussion between the lecturer and students in order to cover the objectives of the topic. To correlate the scientific knowledge to its clinical application. To develop the writing abilities. To cultivate the habits of self-study and collecting information from different sources. Training of organizing thoughts and information then expressing them in a coherent style. The students are divided into groups (5-6 students/each). The topic is specified. References as well as the objectives are given. The students study, discuss and defend their choices and standpoints together under supervision of the faculty member. The topic given in SGD will be presented by one student from each group presenting an objective using different teaching facilities: power point, board, chart, and videos. Office hours are available where a face-to-face exchange of information between student and course coordinator/instructor. Students can clarify their doubts which they feel reluctant to speak up in class. Third and Fourth semester of the program are devoted to dissertation work. The student’s research supervisor holds the primary responsibility for providing the appropriate guidance and counsel essential to the scholarly development of the student. For MSc with specialization in Addiction Clinical Practice, clinical clerkship is obligatory. During third and fourth semester, students will be assigned primarily to clinical rotations in Erada Center for Treatment and Rehab supervised by clinical preceptors. 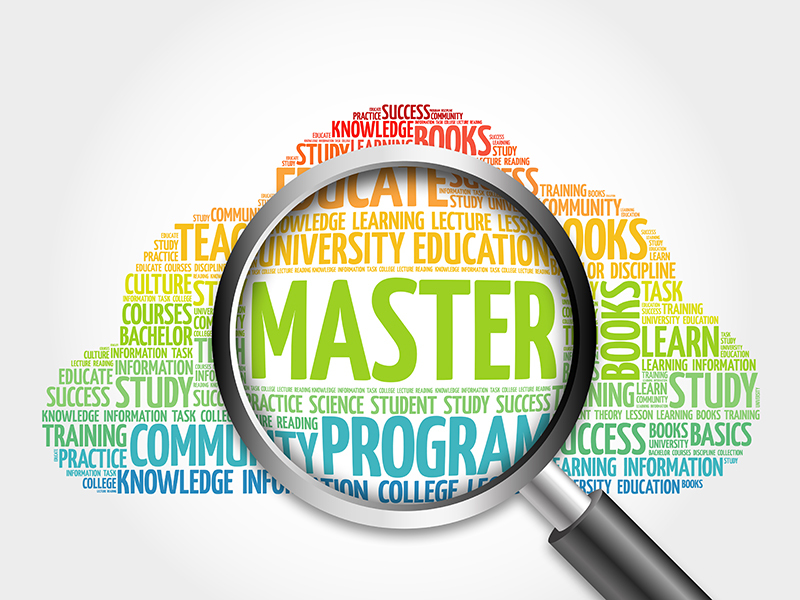 Assessment on the MSc degree program is a mixture of formative assessments (in form of coursework) and summative assessments (written & practical examinations). Assessment of each taught courses is divided into 30% marks from course work (in the form of quizzes, seminars and assignments), and 70% marks from final summative assessment ( in form of MCQs, Short essay questions, practical exam, objectively structured clinical examination and assignment). Coursework varies from course to course and comprises a mix of Practical write-ups, Patient profiles, written reports and essays, small group projects, oral presentations, quizzes etc. Coursework submission guidelines & grading criteria (usually in form of rubric) will be provided by course coordinator. Final summative assessments are scheduled at the end of first and second semester. Exams are normally closed book, though a calculator is permitted in some exams. In order to assess all learning outcomes, all the questions are compulsory in exams. Students who fail to achieve GPA of 60% in taught semesters (first and second) will be put on probation and will be allowed to appear in the supplementary exams held in February and September each year for first and second semester. A student who is unable to attend the final exam of any course because of extenuating circumstances such as serious illness, accident or death of a family member during the final examination period seeks an incomplete grade “I” for the course. No students are promoted to second year (dissertation work and/or clinical clerkships) unless he/she secures minimum of 60% in both first and second semester. The assessment of the dissertation work is based on dissertation and defense at the end of the fourth semester. Dissertation is assessed based on the dissertation and defense with 80% and 20% marks respectively. The examining committee for master’s candidates’ dissertation and defense should be composed of three members with one external member related to the field of specialization. Dissertation defense should be held only after all members of the committee have had adequate opportunity to review a draft of the master’s dissertation. It is the student’s responsibility to distribute copies of the dissertation to the committee members in advance of the defense. The final oral defense may be open to the public or limited in attendance to the candidate and the committee. The defense should be scheduled at least 4 weeks prior to the dissertation submission deadline. A dissertation defense consists of two parts: 1) the student presents her research in front of committee members and/or public and 2) the student responds to questions posed by members of the committee and the audience. The student and the committee members must be physically present at the defense. The results of the final oral examination for the MSc, duly signed by all the examining graduate committee members present, must be reported to the Graduate Program Director within 24 hours after the examination. Students should submit the dissertation with incorporated recommendations by the examining committee before the deadline set by the college. If one or all the examiners decided that the dissertation does not meet the requirements for the degree (failed to obtain minimum 60%), a Master’s student will not graduate. However, the student has the option to revise and resubmit a failed dissertation. In cases where plagiarism in the dissertation is alleged, the examination process does not proceed any further and the case is investigated through DMC disciplinary processes. A student whose dissertation has not passed the examination may choose to revise and resubmit the dissertation. To do so, he/she must contact the program director within 4 weeks of the notification of this outcome indicating the intention to revise and resubmit the dissertation, including a supporting letter from the supervisor(s) confirming that he/she will maintain supervisory oversight for the revision. The Graduate Program Director then shall refer this matter to Graduate Faculty Board. Once the revise and resubmit process has been approved by the Graduate Faculty Board, the revised dissertation must be resubmitted to Program director no later than 6 months from the notification of approval. The revised dissertation will normally be send to the original examiner(s) who will determine if the dissertation has been revised to address the issues raised in the original examiner’s report(s) and has now met the requirements for the degree. If the original examiner is not willing or available to serve, the name of other potential examiner will be suggested. This new examiner will be provided with the original report that did not pass the dissertation, and will be asked to determine whether the revised dissertation has addressed the issues raised by the original examiner’s report and has met the requirements for the degree. If the student does not contact Graduate Program Director requesting to revise and resubmit the dissertation within the designated 4 weeks’ time period or, once approved to revise the dissertation, does not re-submit the revised dissertation by the 6 months deadline, the dissertation will be deemed to have failed and the student will be withdrawn from the university. Should the re-examination fail to pass the dissertation, the dissertation will be deemed to have failed the examination process and the student will be withdrawn from the college. For Master’s students, if the revised dissertation is passed, he/he/she will have fulfilled that requirement for the degree. Clerkship is assessed based on clerkship evaluation (continuous) and final evaluation (Objectively structured clinical examination OSCE and case reports) with 40% and 60% marks respectively. Students who fail to secure at least 60% marks in clerkships, have to repeat the respective clerkship during next six months. If the student again fail to secure at least 60% marks in clerkship, he/she will be withdrawn from the college. Grading at the graduate level is intended to offer feedback to students on their performance in a given course, including once students reach the dissertation and dissertation stage. Faculties are encouraged to specify course requirements and grading expectations for students. He/she should pass all the courses both theoretical and practical as per assessment and grading rules of the college. He/she should complete a major research project and successfully defend it in front of panel of external and internal examiners appointed by college. Student undertaking MSc program, should successfully complete and pass the required clerkships in hospitals approved by college. Maximum duration of 5 years is allowed upon recommendation of the Graduate Program Director and permission from the Dean.